This episode features special guest Zach Weinersmith, author of "Saturday Morning Breakfast Cereal," a popular webcomic about philosophy and science. Zach clarifies his position in the ongoing "philosophy vs. science" fights, poses a question to Julia and Massimo about the ethics of offensive jokes, and discusses BAHFest, his "Bad Ad Hoc Hypotheses" conference lampooning evolutionary psychology, not to mention his movie, "Starpocalype." Somehow along the way, the three take a detour into discussing an unusual sexual act. Zach's pick: "Solaris" by Stanislaw Lem. Thanks, Massimo, Julia, and Zach. Really enjoyed hearing laughter for a change while drinking my morning coffee. Much more satisfying that listening to the local news! Enjoyed the podcast very much. Thanks! 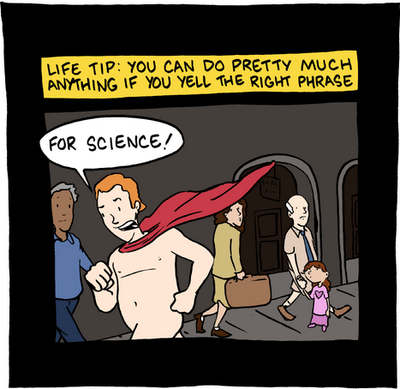 I'm also a big fan of SMBC. You may want to edit the beginning of the episode synopsis; you spelled his name Weinesmith. Anyways, another great episode guys, and keep up the great work. I very much enjoyed the conservation. I'm surprised that he didn't have more of a background in philosophy. Sure, although it seems like exposing cuckoos is not an uncommon theme of your blog. I'm not so sure Tegmark's new book is non-cuckoo either. I have to agree with that one... Though I'm looking forward to the movie with Johnny Depp!